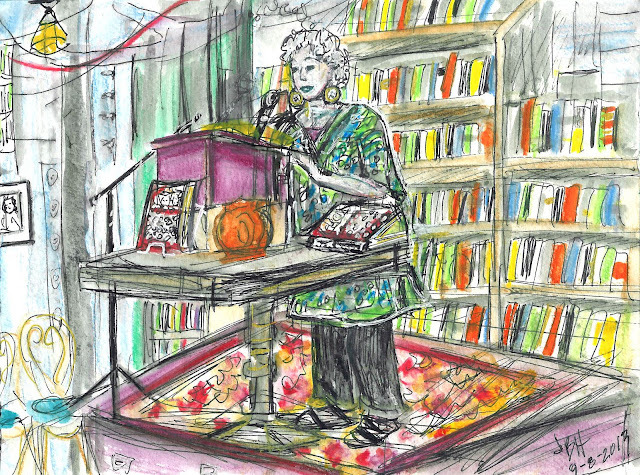 Esther Altshul Helfgott reading from her just published book Dear Alzheimer's: A Caregiver's Diary & Poems at a packed book launch yesterday at Elliott Bay Books. The event was a great success and the book soared to the top of the Elliott Bay Books best seller list: http://www.elliottbaybook.com/book/9781490572789. Powerful poems and insights that get to the heart of what matters in life and in death. Well done Jackie. Great sketch and story.